Are You Using This Super-Simple Method To Increase Your relevance? Good news! In this post I’m going to reveal an easy way to get your emails read and your direct mail opened. Sounds good right? But before we get to that, here’s a short story to make my point – it involves children and animals! As you know, it’s hard to switch off when you’re a business owner. I’m always looking for the next idea which I can implement and I’ve noticed they crop up in the most unlikely of places! Take our recent day out to Pennywell Farm in Devon (if you’re ever in the area and have young kids, it’s well worth a visit). 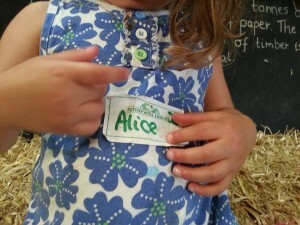 Upon arrival, children are given a sticker with their name and age on (you can see my daughter’s in the picture). It’s such a simple touch but it makes a huge difference to the children’s experience whilst they’re at the farm. At Pennywell, there’s a new activity every half an hour. It’s a great interactive day out and children are actively encouraged to get stuck in. And that’s where the stickers come into play. The staff leading the activities can talk to the children by name. And the result? Instant rapport. Customers are more likely to take notice and respond if you tailor your communication and refer to them by name. And of course, using names is a proven way to build relationships and make people feel more valued. And that’s sound business sense. If you want to get your emails read and your direct mail opened, personalise it. Simple! Avoid turning people off with general broadcasts and instead, carefully craft your marketing messages so they appeal to a specific target audience. Getting close to your customer avatar will help. That’s because when you know who you want to attract, you’ll automatically hone your message to appeal directly to those people – and the result – you’ll instantly be perceived as more relevant. Next, use your customer’s names wherever you can (and to help you do that, consider the contact details you ask for when recording a lead). This will make your email marketing feel more intimate. After all, an email that simply says “hello” is obviously a piece of mass communication. Try personalising your envelopes when sending direct mail. 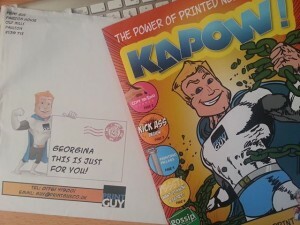 Just check out the awesome envelope that my printed newsletter from Print Guy arrived in. Can you imagine that being left unopened? In addition, you can also weave personalisation into your social media campaigns and other marketing strategies. There’s stacks of good practice out there that you can swipe and deploy. 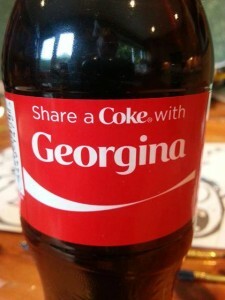 For example, Coke embraced the power of personalisation over the summer with their much talked about names on coke bottle campaign. And Ikea is also exploring the benefits. One of my colleagues told me how her local Ikea had a green screen at their local store and was taking family photos to put on catalogues. Now that’s one way of ensuring it doesn’t end in the bin. How could you use personalisation in your business? There’s stacks of scope to use personalisation creatively in your business. I’d love to hear your success stories so please let me know in the comments below how you’ve used personalisation to attract more leads, get more sales and grow your reputation. Thanks very much 🙂 Quite often it’s the simplest of things that can make the biggest difference to your results.